I had a client who was really trying hard to lose weight. She counted calories. She had tried all of the most popular weight loss programs out there. She was tired, ragged, and worn out in her attempt to find something that worked. Every program she tried – in the long run, just didn’t work. A couple of weight loss programs worked at first, but then – after a month or two – she just gained the weight right back. And with some of the programs, she not only gained what she had loss right back, she gained even more weight. Sheesh! She was frustrated to no end. One of the reasons for her inability to lose weight was because of her mindset. In her minds eye, she saw herself having challenges. She never created an image of herself – getting thinner. She had no vision of herself losing the weight she wanted. She did not even have an image of her being successful in the process – in any way. The vision she had was of her struggling to lose weight. She saw herself not losing weight. She had no clear vision of how she would look after losing weight. THEREFORE, the decisions that she made, subconsciously, were centered around NOT losing weight and failing in the weight loss programs that she tried. This was her vision. We used a picture from her past in the visioning exercise. Afterward she posted copies of the picture – in her house, car, office, bathroom, on the fridge and oven doors, and by the door going out to the garage. We had to work hard at her not hating the pictures, but loving them. Sometimes we get angry at pictures from the past that remind us of what we DO NOT HAVE. That anger creates blockage to getting what we want. Its best to love that part of your past. LET GO OF THE ANGER. LOVE who you are today, by embracing you were yesterday. Get informed about weight loss through fat burning methods. Until The Nest Post… take care. 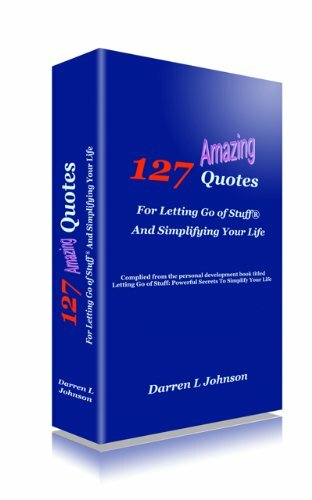 This entry was posted in Health, Letting Go and tagged change, counting calories, darren l johnson, fat burning, fear, happiness, Letting Go, letting go of stuff, stress, weight loss. Bookmark the permalink. Well said. The reframing of the weight loss process can be the most powerful catalyst to success. The conversation of what I ‘have’ and ‘don’t have’ can be seen in an entirely different light. This approach is worth considering for anyone who has tried to lose weight and failed. Additionally, it seems that many people have trouble “loving their past.” It might be hard for many to understand the power in loving our past. We are so conditioned in society to “hate” or “hold our past in contempt” rather than to accept it through a process of love. For some, it might sound unusual to “love your past.” Why knock it until you have tried it. Right? Glad you liked the article about letting go and weight loss. Thanks for sharing your comment. If you would like to get free advice for letting go, feel free to check out this page as well. CLICK HERE. Hi Brayden. I wanted to share a more recent post on my blog. Great post Darren focusing our mind, managing our emotions and then taking action are 3 of the most powerful things we can for health, well being and ultimate success and happiness. Hi Suzanne. I want to share the most recent post on my blog.